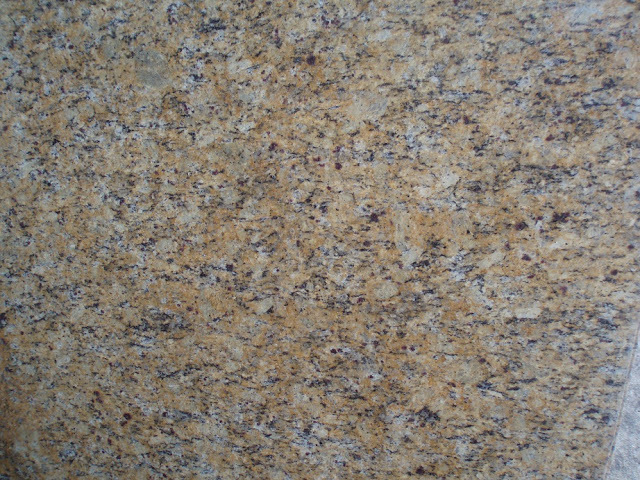 Our color spotlight of the day is… Santa Cecilia Gold granite! This color is one of the many variations of Santa Cecilia granite that can be found. It is a wonderful combination of gold, black, white and gray colors. When you view its design and color from a distance, you will see that the dominant color is gold. Once you take a closer look, you notice that there are specks of black, white and gray minerals that make up its pattern. The abundance of these small dark spots all over the stone gives it a leopard look. One of the things that sets Santa Cecilia Gold granite apart from others, is its distinctive combination of colors, perfectly patterned to naturally produce a unique and highly personal design that that is loved by many. The colors may vary under different lighting conditions; under natural sunlight or intense indoor lighting, the gold and yellow tones will be highly noticeable and will seem to shine more. Slabs of Santa Cecilia Gold granite are naturally dense which makes it very durable and highly recommended for both indoor and outdoor projects. Each granite slab is unique, with the swirls and patterns taking different courses throughout each slab. To reach its full splendor, Santa Cecilia Gold granite is best paired with neutral, light and luminous surfaces. When using it for kitchen countertops, it is best combined with simple and modern, light colored furniture. Otherwise, the kitchen will seem busy, with too much going on. The countertops are the focal point of the kitchen, with very little else needed to complete the decor. This stunning granite color provides an earthy feel and add more personality to your kitchen. It is a perfect choice for your next kitchen countertop renovation. When choosing a patterned slab of granite, it is best to see and choose the slab in person. Each slab is unique, with the main colors, veins, and patterns varying from one to the next. This way you select the exact one you want for your project. Santa Cecilia Gold is one of the top choices among our clients. Stop by our warehouse today to reserve your favorite granite color!